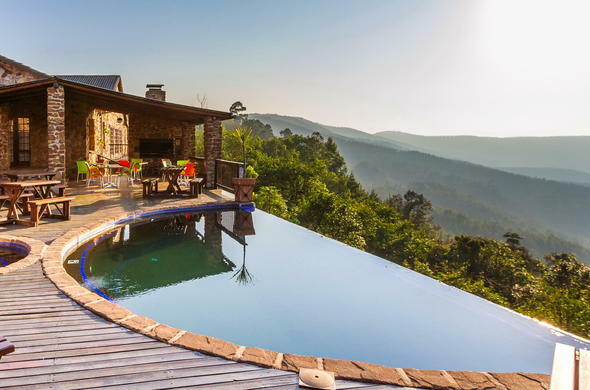 Experience true country living at Misty Mountain, a tranquil country hotel accommodation in Mpumalanga situated on the spectacular Long Tom Pass. Misty Mountain, accommodation in Mpumalanga, is a relaxed, informal owner managed establishment. The chalets are geared for couples or families. The tariffs include bed and breakfast but, for lunches and dinners, guests can self cater or enjoy good country cooking in the restaurant. On a summer's day, you can lounge around in the sun on the fabulous pool deck. On a winter's evening, huddle around the log fires and enjoy the warm hospitality from Misty Mountain's accommodation in Mpumalanga. Most guests visit Misty Mountain to get away from it all. To walk, to fish, to catch up on a bit of reading, to enjoy a glass of wine around the fireplace and to soak up the views. At your accommodation in Mpumalanga there are no rules and guests can be as flexible as they wish. Enjoy some quality family time over guided quad biking trails, trout fishing and explore the this little hidden gem of Mpumalanga on foot with your loved ones. This accommodation in Mpumalanga has so much to offer. Open fire places, outdoor cooking, comfortable furnishings and the daily servicing gives guests a home from home country welcome. At this Mpumalanga lodging you can either have a lazy or jam packed day exploring the Mpumalanga Lowveld. The perfect ending to an idyllic day could be spent curled up in front of a roaring log fire.